If you are looking for comfort and style, look no further. Drive Medical's adjustable height folding gel grip cane has you covered. The gel grip is designed to reduce stress and hand fatigue providing a more comfortable experience. The handle height is adjustable from 33 in. to 37 in. allowing for personal sizing. As an added bonus, a handy wrist strap attached to the handgrip will ensure that you are always in reach of your cane when you need it. The cane easily folds and unfolds with out tools, making storage or travel convenient. The product is manufactured with sturdy, 1 in. diameter anodized, extruded aluminum tubing which can withstand a weight capacity of 300 lbs. Colors available are black, blue crackle and red crackle. Oversized Item - Ground Ship Only: . 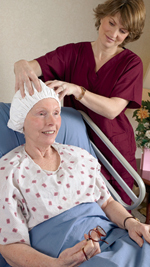 Personal Hygiene Item - Non-Returnable: . This product was added to our catalog on Wednesday 01 February, 2012. I currently have one of these and as things go it is wearing ..